Back in early 2017 when I stumbled across Asian Skincare I was immediately drawn in. Ever since I hit 20 I’ve struggled with acne. Blogs and reviews I read were raving about how great Asian Skincare was against acne and wrinkles and basically any skincare complaint you might have. I spent hours researching routines and products. I wanted to follow the routine to the letter. The big thing about building up to the ten steps is that you have to introduce new products slowly. If you start reacting to something negatively you need to know what product is causing it. If you’ve just introduced three new products in the last week and suddenly get a break out, it’ll be tricky to work out the cause. To start off you just need four products really: a first cleanser (generally oil based or a balm), a second cleanser (usually a foam), a moisturiser and the all important SPF. Just before I discovered Asian Skincare I’d started having a massive acne flare up, so I knew it was time for a change. Before long, I had two cleansers (well three as I picked up an exfoliator too) that I was enjoying using. My routine started with the Etude House Sherbert Cleanser to remove the make up. Next up was the Innisfree Pore Cleansing Foam. The Tosowoong powder wash was a once a week exfoliation. This only applied to my evening routine. In the morning just a splash of water was all I used and needed. Over the summer my skin did start to improve. I’d added in a moisturiser, eye cream and sheet masks to my skincare regime. Unfortunately in late summer I added in an essence and that’s when the issues started. My acne flared up again in a big way. My skin was probably the worst it has ever been. I quickly ditched the offending essence but my skin never recovered. I tried different cleansers, a different essence and changed up my moisturiser. Nothing worked. In fact it was getting worse. I’d been introducing products slowly so I could track what I reacted to but it just seemed like my skin had started rebelling against everything. As I was tearing my hair out wondering what to do, I remembered discovering the Make Up Eraser (review post here) a couple of years previous. I’d been deep in using lots of different anti acne cleansers and my skin had obviously just started reacting because of all the chemicals. I stopped them all and just started using the Make Up Eraser, followed by a micellar water. My skin started clearing up quite quickly. Out of other options, I ditched all my Asian Skincare cleansers and went back to that routine. I picked up a small bottle of micellar water and a new Make Up Eraser and got started. This has been my routine now for a few weeks now and my skin has settled right down. It’s the best it’s been in months. Very few spots have popped up, my older acne is fading and I’ve had no dry and irritated skin. I’ve even been able to introduce a clarifying toner and essence into the routine with no ill effects. Am I permanently ditching the double cleanse? As much as I would like to return to my old cleaners (I loved my Banila Co one) I just don’t want to risk it. Twice now, stripping back my cleansing has sorted out my skin and that can’t be coincidence. While it’s nice to read about these fantastic routines that other people put together sometimes you just have to listen to your skin. 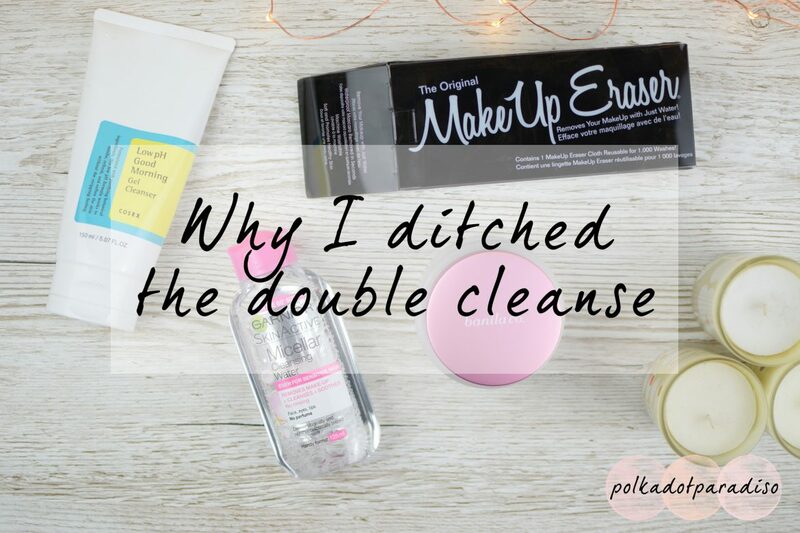 Technically I am still double cleansing, just not with the normal products. The other elements of the Asian Skincare routine are working well for me – the COSRX Snail Essence is one of my favourite ever products and I love the sheet masks. With it being the New Year and the time to start new things I figured this would be a good time to talk about my little cleanser journey. The thing that I’ve learnt from all of this? If you have something that works for you, don’t force yourself to change things up just to follow a particular routine or plan. I wonder what my skin would be like if I’d introduced other elements of the Asian Skincare routine, and left out the new cleansers to begin with. If you want to know more about the ten step routine then I highly recommend Maple Tree Blog – she has a wealth of info and explains it so much better than I!